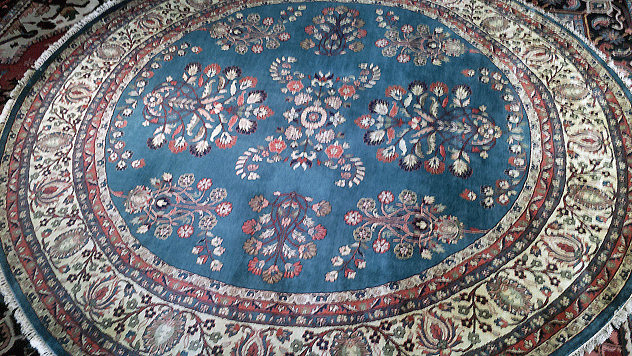 Nejad Persian Hunt Tabriz rug in vivid navy blue occupies this not yet fully furnished New Hope PA living room. that all adds up to repeat business. 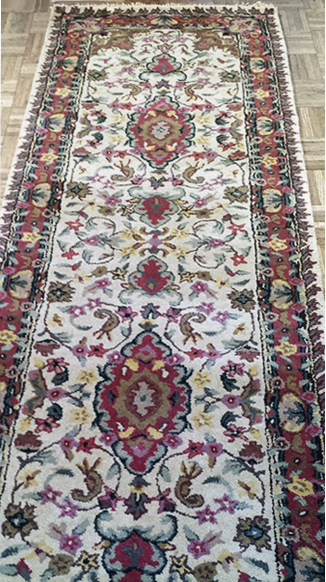 Case in point: a New Hope PA client who recently purchased this hand-knotted wool genuine Persian Hunt Tabriz rug from Nejad is the same client who had purchased rugs from our Doylestown showroom, located at 1 North Main Street, on at least a few occasions in the past, prior to having made this most-recent purchase. Thanks to all our customers for their continued loyalty! New clients from Rydal Pennsylvania, a suburb of Philadelphia, came to our Oriental rug showroom in Doylestown Bucks County looking for a round Oriental rug for their dining room and a coordinating long runner for their hallway. Because their dining room has a very large open entrance to their hallway it was very important to our clients that they find rugs with colors and designs perfectly complementing each other so that their designer could continue with the same color palette in wall paper, paints, and fabrics from one space to the next. 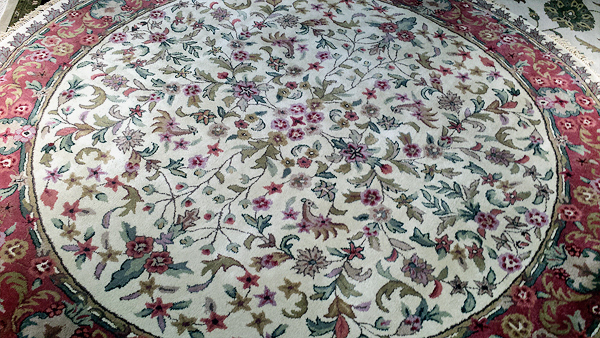 After looking at dozens of excellent possible combinations, our clients choose our beautiful Persian Tabriz design T020 in Ivory & Rose in an all-over pattern for their round dining room rug and the coordinating runner in the same design but with center medallions for their hallway. 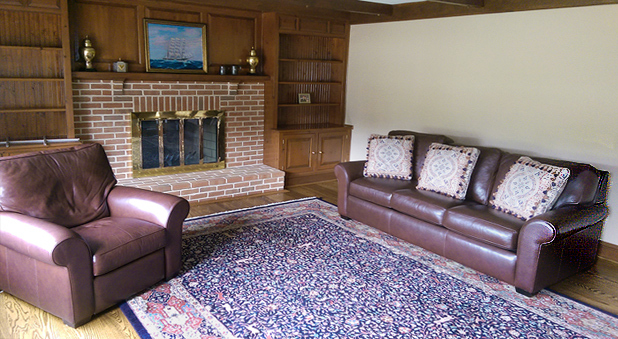 Many of our rugs are specifically designed in both an all-over pattern and a medallion pattern for the very function of having more similar rugs in the same space without being identical. Designers and architects often use this technique for the reason that the dye lots and scale of design elements are alike, providing the repeat of pattern and color that creates a pleasing flow and balance to the room’s décor.